Chicken Stock going into the Freezer! Once you have had homemade stock, you will NEVER buy the canned or carton stuff again!! So many of my recipes call for Homemade Chicken Stock and this is the recipe I use, adapted from the Cookbook. WARNING…. This is why you don’t want to EVER BUY chicken Stock AGAIN! ~~~Chicken flavor, zanthum gum, vegetable flavor, WHEAT, (combos of sugar), Canola Oil, flavoring, potato flour~~~~ WHAT?!?!?!??!? It’s organic but it’s ORGANIC CRAP!!!!!! Check out what the Weston A. Price Foundation has to say about bone broth HERE. **Drink this broth as a soup, it is that delicious! **Don’t discard the fat. It will rise to the top and actually help this stock keep well in fridge. **Freeze in glass jars or refrigerate for a few weeks. Crock Pot Directions: Place all ingredients in Crock Pot. Cook on low for 8-10 hours (or longer). Strain use bones in Bone Broth below. Instant Pot Directions: Place all ingredients in IP. Set to "Soup" and cook for 120 minutes. All to natural release or instant release if in a hurry. 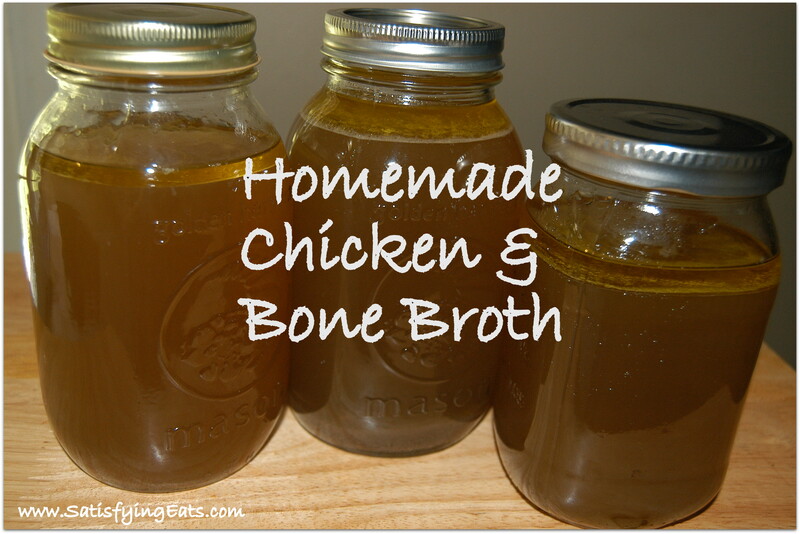 Strain use bones in Bone Broth below. Remove meat from bones and add back to Crock Pot or Instant Pot. Add same amount of water and seasonings as listed in recipe. Follow directions again for Crock Pot or Instant Pot. Drain off broth and store in fridge around 1 week. If you pour the hot broth into jars and refrigerate, I have had it last a few weeks because the fat rises to the top to create a seal. Pour into glass jars. Cover with lid and refrigerate. If freezing, open jar to release seal and then freeze. NOT doing this will result in busted jars. Hi, I finally made my own chicken broth! Thanks for the recipe! I always cook whole chickens in a crockpot so I figured I might as well make some broth! I am putting the broth in mason jars to go in the freezer. Is there a certain amount of space needed in the jar (from the top to the liquid)? And did you go through the process of pressure canning? Thanks! After making the bone broth, the bones will become soft and you can crush them easily and feed to pets.